Gypsy Scholar: Islamic Civilizational Meltdown? When you look at it from Europe - I've been in Germany and Britain the past week - you see a situation developing to the south of here that is terrifying. It is not only a refugee crisis. It's a civilizational meltdown: Libya, Yemen, Syria and Iraq - the core of the Arab world - have all collapsed into tribal and sectarian civil wars, amplified by water crises and other environmental stresses. But - and this is the crucial point - all this is happening in a post-imperial, post-colonial and increasingly post-authoritarian world. That is, in this pluralistic region that lacks pluralism - the Middle East - we have implicitly relied for centuries on the Ottoman Empire, British and French colonialism and then kings and dictators to impose order from the top-down on all the tribes, sects and religions trapped together there. But the first two (imperialism and colonialism) are gone forever, and the last one (monarchy and autocracy) are barely holding on or have also disappeared. I don't claim any expertise in economics and thus don't know if President Obama is right or not about trade, but I do dabble in history and cultural comparison, and I think that Friedman is either 100% right or 100% wrong on his warning of a "civilizational meltdown." Either we're watching the Islamic world's awful collapse, or we're watching its even more awful resurgence in its most virulent form as the Islamic State expands its influence in various parts of the Muslim Ummah. What should we do? How should we respond? I don't really know. Whether we do something or do nothing, things just seem to get worse. About all I can do is continue analyzing events . . .
"Libya, Yemen, Syria and Iraq - the core of the Arab world - have all collapsed into tribal and sectarian civil wars, amplified by water crises and other environmental stresses." That's right, they just happened to collapse all on their own, eh? "But the first two (imperialism and colonialism) are gone forever, and the last one (monarchy and autocracy) are barely holding on or have also disappeared." Phew, no more imperialism or colonialism in the Middle East, what a relief! Could it be that Mr. Friedman is not actually a real person, but simply a bot programmed by the Pentagon and the State Department to produce endless torrents of imperial propaganda? If so, well played! 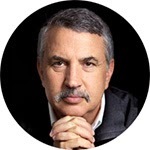 Scott, let me link that for you: Thomas Friedman's Iraq Amnesia. Actually, I don't have to wonder much at all. He wouldn't say anything at all, and you can take that to the bank, my friend. There's a category of amnesia called "retrograde amnesia" that might offer an appropriate pun in this context. Thomas Friedman sums up the Iraq war . . . The only way you can forget something is if you knew it in the first place: "We're an empire now, and when we act, we create our own reality. And while you're studying that reality—judiciously, as you will—we'll act again, creating other new realities, which you can study too, and that's how things will sort out. We're history's actors … and you, all of you, will be left to just study what we do." I've heard that empire quote attributed to Karl Rove and to George Bush. The wording sounds a bit too articulate for Bush. I leave it to you to pursue the metaphor to its logical conclusion. "The wording sounds a bit too articulate for Bush." Funny you should say that: "Bush, who has probably never even read the PNAC agenda, was selected for entirely different reasons. Knowing that the agenda would be highly unpopular, the clique decided that defending it logically would be very difficult, even with complete control over the media. An articulate and intelligent President would look like a fool if he tried to defend the insane policies. So, our clique slyly figured, why not put someone up there who is obviously a fool, right through his whole little soul, so that the public will believe they are struggling against the foolishness of one man, and have no understanding of what’s really going on. Of course Bush, being clueless on all matters apart from golf, looting, cocaine, and womanizing, would need to be kept far away from any role in running the White House. Hence the need for Cheney, the shadow real president, who leaves all the photo ops to Bush, who stays out of the public eye himself, and who carries the Black Armageddon Box with him everywhere he goes, something only official Presidents have done in the past." BTW, the US has been involved in yet another war of aggression in the Middle East for the past month, and radically escalating confrontation with Iran to boot, and yet all I ever seem to see on the front pages of the MSM in the US these days is yet another case of "police brutality" against African-Americans. Coincidence or not? Is playing the "race card" just another way of distracting the sheeple from what their own government is really doing in the wider world? Perhaps if US taxpayers really knew what was going on in the far reaches of the Empire, they wouldn't be so willing to foot the bill? What say ye, Tommy Boy? Karl Ove Knausgaard's struggle to recall . . .